Philippines President Benigno Aquino has signed into law a bill providing for free access to contraception and family planning. Supporters say the law, which took 14 years to pass, will reduce poverty and maternal mortality in a country with the highest birth rate in the region. The Roman Catholic Church repeatedly tried to block the bill. The country's Congress failed to pass the measure several times before giving it final approval on 19 December. The law is due to take effect in mid-January, said presidential spokeswoman Abigail Valte. "The passage into law of the Responsible Parenthood Act closes a highly divisive chapter of our history - a chapter borne of the convictions of those who argued for, or against this act," she said. "At the same time, it opens the possibility of co-operation and reconciliation... engagement and dialogue characterised not by animosity, but by our collective desire to better the welfare of the Filipino people." 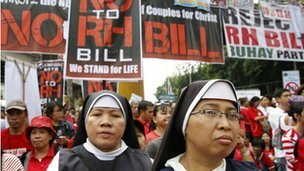 The BBC's Kate McGeown reports from the capital, Manila, that even now the bill has become law, the Church and its political allies could still derail it. Several bishops have already threatened to contest the bill's legality in the Supreme Court. More than 80% of the population in the Philippines is Catholic, and the Church has had the support of many politicians, media commentators, and businessmen. Condoms are widely sold in the Philippines, but at a price that many people cannot afford. Many maternity hospitals are struggling to cope with the number of births, and the UN appealed to the Philippines earlier this year to pass the family planning bill. A government health survey in 2011 found that the maternal mortality rate had risen by 36% between 2006 and 2010.